Notes: A background song from the anime Bleach. 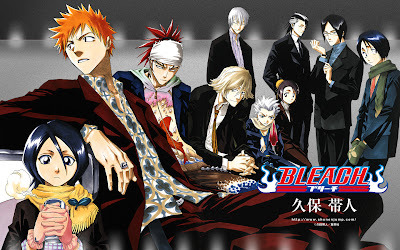 Bleach was the anime that got me into the whole anime/manga craze, so I have rather emotional ties with this anime, despite the negative feedback that other people give. I think this manga has a brilliant storyline (at least the first season does), I love the characters and Kubo's artwork is unique. Kubo's a natural at drawing manga, he can capture deep and realistic human emotions with very few strokes of his brush, his pacing of the story is good, and his panels tend to be drawn at uncommon but effective angles and perspectives. Furthermore, Bleach is full of action, swords and bishies, the three things that makes my otaku life complete. This song always makes me sad when I listen to it. I remember it being played during the scene where Rukia is imprisoned and she reflects back to the happy moments she spent with Ichigo and co..